CD reviews: "Revival," "No Boundaries" and "Nhava"
Twenty years after Paul Simon supposedly "introduced" South Africa's Hugh Masekela and Ladysmith Black Mambazo to the world, both those groups remain vital, creative forces on the world stage  long after Simon has been relegated to the oldies circuit. Masekela has, in fact, been a presence on the American scene since the late 1960s, when he scored with the international hit "Grazing in the Grass." He was living in the U.S. then, but while perfectly comfortable in jazz his heart remained in his native South Africa  to which he returned in the 1980s. Now in his mid-60s, Masekela continues to make music as accessible and upbeat as ever  maybe more than ever, given that conditions in his homeland are vastly improved from the dark days of apartheid. His trumpet playing retains its bright disposition, his vocals still have all their warmth. But don't think Masekela has gone all soft and fuzzy. If there is now majority rule in South African, that's hardly the rule everywhere  nor does democratic rule ensure perfection. On "Sleep," Masekela challenges the leaders of countries from Zimbabwe to Congo to Rwanda to Somalia to Pakistan to Haiti. A sample: "How do you go to sleep at night in Rwanda when the smell of the bodies in the middle of the lobby reeks?" And on "Working Underground," he takes on current conditions in the minefields of South Africa. But even when he's dealing with the worst human misery on earth, Masekela still wraps his tough lyrics around luscious melodies and superb playing. "Woman of the Sun" is as gorgeous as "Grazing in the Grass"; "Working" as funky and danceable as his 1986 ode to Nelson Mandela, "Bring Him Back Home." It's good to hear that someone who helped invent "world beat" back in the day is still weaving hypnotic beats and unforgettable melodies into some of the best music on the planet. 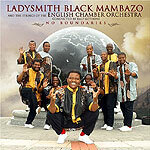 Ladysmith Black Mambazo, now into their fourth decade as a band, continue to simply amaze with the power of their vocal harmonies. For their new album, they recorded with the string section of the English Chamber Orchestra. The result is a collection of music even richer, more powerful and even more regal than their earlier recordings. Founder and leader Joseph Shabalala remains in fine voice and a figure of towering spirituality; while few record stores will stock LBM albums in the Christian section, this is definitively Christian music  from Shabalala's originals to the European classical songs the two groups tackle here. The most interesting moment here is likely Bach's "Jesu, Joy of Man's Desiring," which pairs Shabalala with classical European singer Robert Brooks. It is utterly enchanting. Their interpretation of Schubert's "Sanctus" is almost as magical, with Brooks singing over the chorale of Ladysmith Black Mambazo. And turning Mozart's "Ave Verum Corpus" into a gospel song with classical accompaniment simply turns it into something wondrously new. If not as well-known to Western audiences as fellow Zimbabwean legend Thomas Mapfumo, Oliver Mtukudzi has been on the scene nearly as long (going back to before Zimbabwe came into majority rule 25 years ago) and has a musical voice at least as polished. Popularly known as "Tuku," Mtukudzi's music as presented on his latest release is brighter, more upbeat than Mapfumo's  which can be atmospheric and moody. Mtukudzi's is just as danceable and melodic as Masekela's. So big is Mtukudzi as an icon in his homeland, that during recent elections that were roundly condemned as rigged, the Mugabe regime found itself feeling the need to claim it was being unfairly criticized by Mtukudzi in his music. Mtukudzi denied any partisan role. This is powerful stuff  the kind of music that can make a dictatorial regime nervous. It is rhythmically similar to the above South African releases although, according to the AllMusic online guide, it is drawn from different tribal styles. But just as gospel and blues, country and tejano, may be utterly distinct to their fans yet roughly related to the rest of us, so South African and Zimbabwean have enough broad similarities that, to Western ears, if you enjoy one you're likely to enjoy the other as well. Melodic, bright, and nearly always uptempo, the music on Mtukudzi's latest release is instantly accessible to Western ears. It's fun music  even if the message of those songs is as deadly serious as the politics of his home country.